Of all the squeezy clamps that I have tried out in a store or used in the shop, this is the first one that I can reach for with confidence. 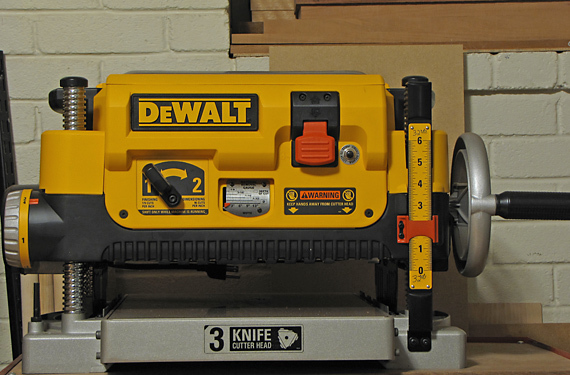 The tightening handle is big and comfortable, making it pleasant to apply the rated 600 pounds of force. The bar is a sturdy I beam. The release trigger is readily accessible and has a nice curve onto which I can hook my finger, making it easy to release the clamp pressure. And my fingers do not get bumped in the process. 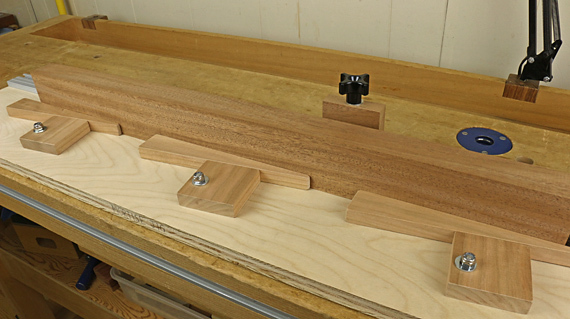 Most of the other clamps of this type that I have tried out have an annoyingly uncomfortable release. 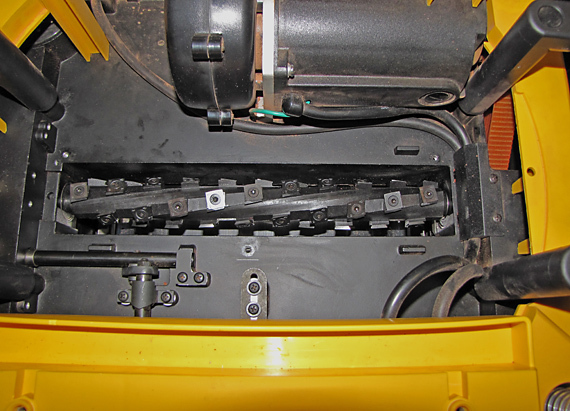 What I like most are the large rectangular pads, which are almost like those of a parallel bar clamp. The throat depth is about 3 3/4″. The pad material is just right – soft enough to protect the work but not squishy. 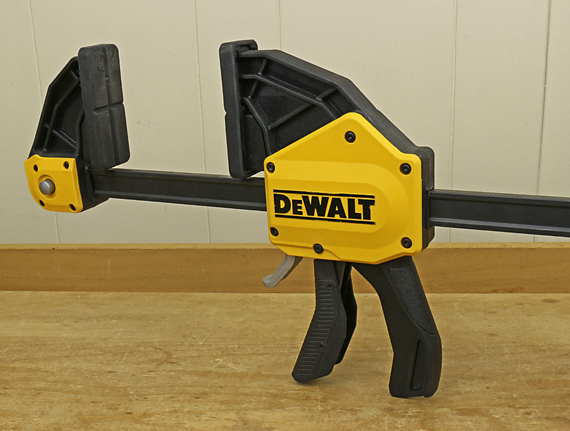 The fixed jaw can be easily reversed to use the clamp as a spreader. 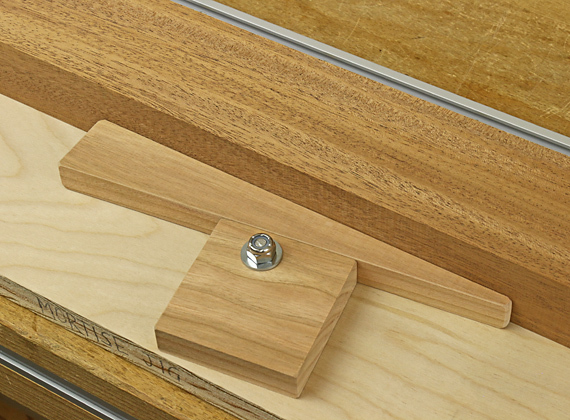 Squeezy clamps are wonderfully handy for bench work, but have a tendency to shift the workpiece alignment when used for assembly. This is inevitable if you squeeze down the force in one fell swoop. I suggest the following technique to avoid workpiece shifting. Gradually pump in the jaw contact while maintaining the workpiece alignment with the other hand, readjusting it if necessary. 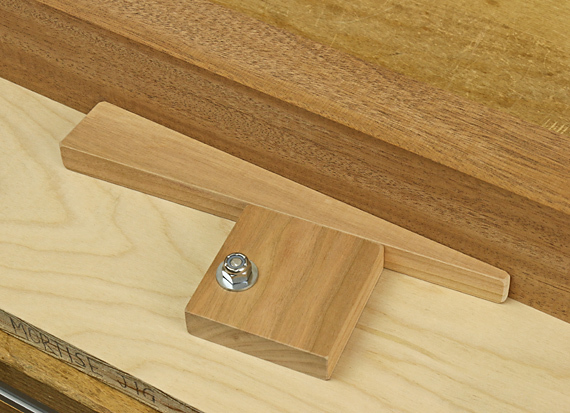 As you take up the toe-in of the jaws (which is mostly in the moveable jaw) and build just a little bit of pressure, the clamp itself will stabilize. This is the key moment because then, and only then, can you bull down the force and the workpiece will remain stable. I usually find it best to hold the fixed jaw against the workpiece and advance the moveable jaw into contact. You can find them at the orange palace and elsewhere. I was pretty much content with my Tormek for grinding tools for 16 years. It sacrificed speed for relaxed and reliable grinding with excellent jigs, especially the SE-77. Though that tradeoff suits me, I like woodworking a lot more than sharpening, so a faster pace at the grindstone was always welcome. 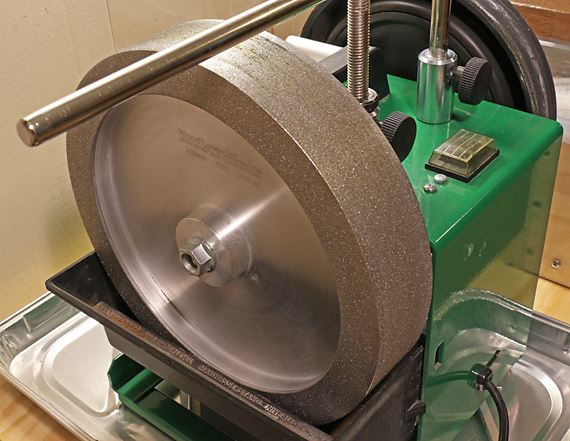 Thus I was drawn to try a CBN grinding wheel available from Woodturner’s Wonders. After working with a CBN wheel for several months, I am completely sold. The main reasons are simple: It is much faster than the Tormek OEM wheel, and it never needs dressing. For my sharpening system, detailed in an earlier post, the 200-grit wheel works extremely well. 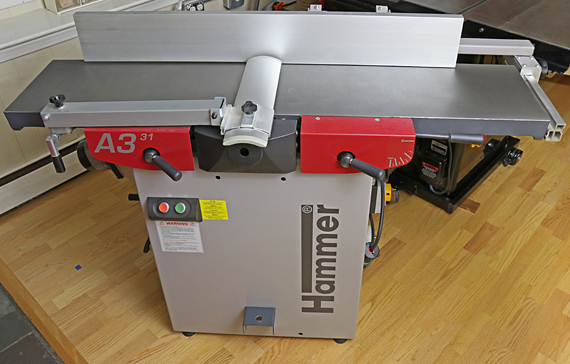 I can grind the primary bevel out to the edge, such as for completely reshaping the edge, with no worry about drawing the temper, even using the wheel dry. From there, I will usually do a bit of work on the 45µ DMT DiaSharp stone, and progress from there. 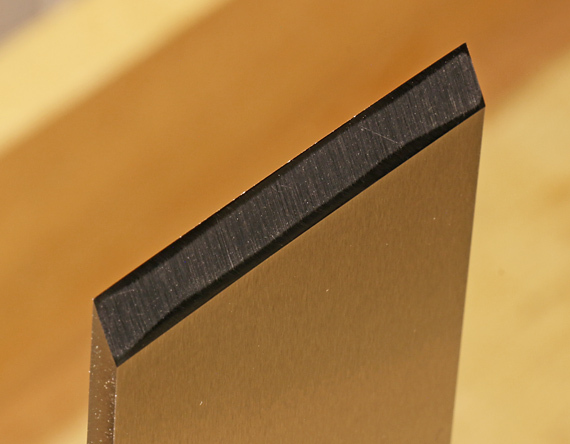 If I stop grinding the primary bevel short of the edge, I may go directly to the 9µ DiaSharp, or touch up on the 45µ, depending on what I am dealing with. In any case, I then move from the 9µ, to the 3µ DiaSharp, and finish with the 0.5µ Gukomyo. Creating even substantial camber on a plane blade using the CBN wheel, particularly with the SE-77 jig, is so easy that it feels like cheating. Woodturners Wonders sells these Tormek replacement wheels, called “Tornado Waterless CBN Wheels,” in grits from 200 to 1200. Depending on your sharpening system, you may want to consider the finer grits. Of course, finer grits are slower but leave shallower scratches. I found the 600 to be slower than I wanted, but it still beat the Tormek OEM wheel. The Tornado wheel is two inches wide, flat and true, 10″ in diameter, with one-inch sidewalls. If I were a piece of tool steel, I’d wave a white flag at first sight of this thing. CBN, cubic boron nitride, is a crystal lattice of boron and nitrogen molecules, with a hardness near that of diamond, but with superior chemical and thermal stability, which increases its durability. Ken Rizza of Woodturner’s Wonders, the same guy who sells this great lamp, also sells a wide variety of other CBN wheels for regular bench grinders, including radius-edge wheels. 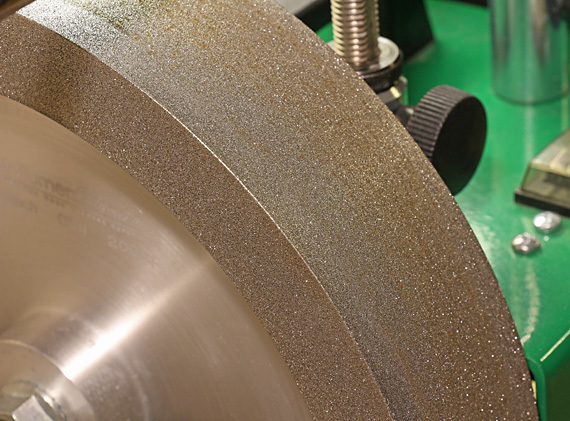 By the way, fellow Tormek users, I do not miss the touted dual-nature (220/1000-grit) of the Tormek OEM wheel, which is achieved by using the grading stone. I have always found this to be of marginal benefit and just not worth the hassle. 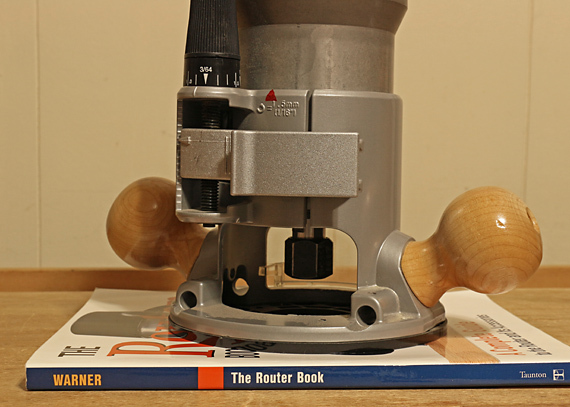 Incidentally, the Tormek leather honing wheel does not get much use in my shop; it is not part of my main sharpening system. The Tornado wheel can be used dry on the Tormek. Aggressive sharpening will produce some heat but I have not found this significant because the work is done so quickly. However, I prefer to use a little water to reduce the spread of the steel dust, including into the air. I just wipe off the accumulated steel dust on the tool itself. One more thing. If your Tormek wheel, like mine, has been on since the pre-smart phone era, it may be tough to get off. The folks at Tormek advise us to remove the stone with the shaft, use penetrating oil on both sides of the shaft, and let it work in overnight. Tap the shaft with a mallet. Repeat. It may take days. Don’t ask me how I got the wheel off my Tormek because it wasn’t pretty. This review of the WTW CBN wheel is unsolicited and uncompensated. I just want you to have great tools . 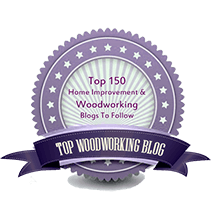 . . so you can make great stuff from wood.